Choosing between the 2018 Dodge Durango vs the 2018 Chevrolet Tahoe can be difficult. However, when put under scrutiny, it becomes clear that one of these SUVs has far more value to offer drivers when it comes to trim levels, engine performance and storage space. The 2018 Dodge Durango is offered in five trim levels: SXT, GT, Citadel, R/T and SRT. In comparison, the 2018 Chevrolet Tahoe is available in only three: LS, LT and Premier. When it comes to engine options, the 2018 Dodge Durango has three while every 2018 Chevrolet Tahoe is powered by the same engine. Overall, 2018 Durango drivers have a lot more choice when it comes to customization than 2018 Tahoe drivers. 47.7 cu.ft. Standard Cargo Capacity 15.3 cu.ft. 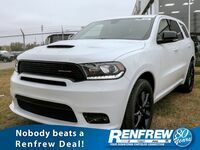 The 2018 Dodge Durango’s most-powerful engine, a 6.4-liter V8 engine with 475 horsepower and 470 pound-feet of torque, outperforms the standard engine found in the 2018 Chevrolet Tahoe, a 5.3-liter V8 engine with 355 horsepower and 383 pound-feet of torque. The 2018 Durango can also tow up to 8,700 pounds, which is 300 pounds more than the 2018 Tahoe. In terms of cabin space, the 2018 Dodge Durango offers much more space than the 2018 Chevrolet Tahoe. With all seats in place, the 2018 Durango has a standard cargo capacity of 47.7 cubic feet, while the 2018 Tahoe only has a cargo capacity of 15.3 cubic feet. With all seats folded down, the 2018 Durango’s maximum cargo capacity is 84.5 cubic feet. 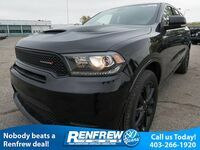 Standard 2018 Dodge Durango safety features include: A post-collision safety system, an engine immobilizer, emergency braking preparation, rear door child safety locks, brake drying, child seat anchors, stability control, emergency braking assistance, a remote anti-theft alarm system, dusk sensing headlamps, tire pressure monitoring, auto delay off headlamps and traction control.